I bought a vintage drawer about a year ago thinking I would use it for something one day. Recently I saw on Pinterest an idea for making an end table with one and showed it to my husband. He used his woodworking skills and got on it right away. We had all of the materials already available in his workshop. My friend had recently given me some furniture legs which is so great to have for projects. It all started with this drawer. 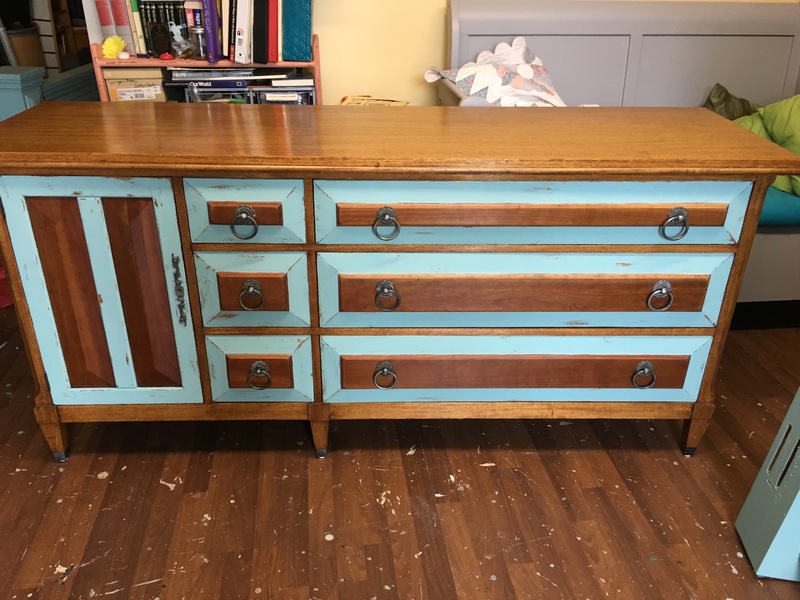 I loved the style and the drawer pull. 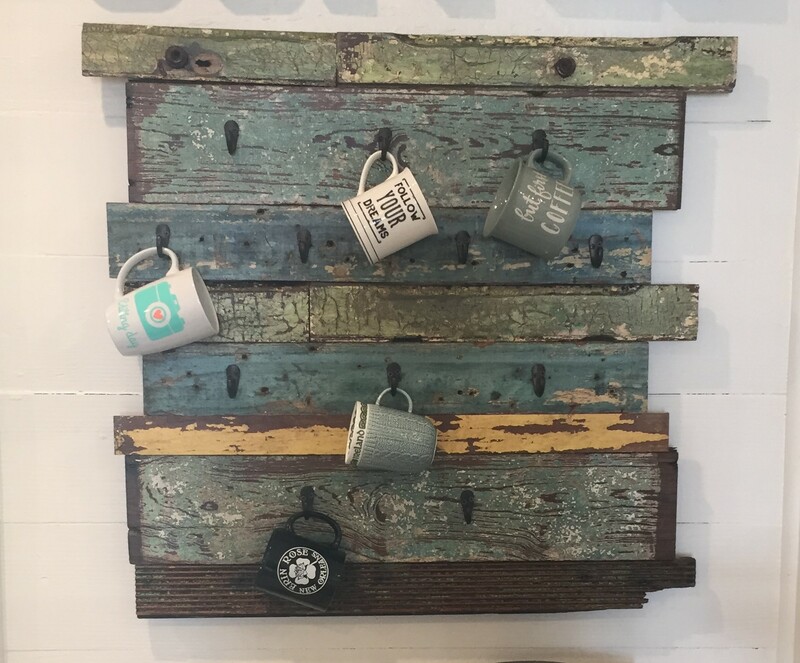 This shows it with a new piece of wood in the inside since it needed to be sturdy to hold things. First my husband put the legs on. 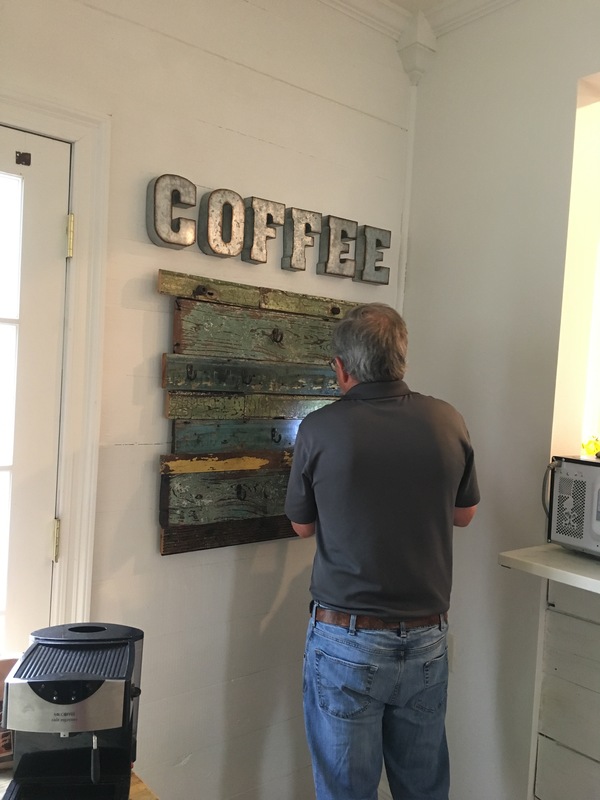 Then he made a bottom shelf using some new wood for the base and then reclaimed wood pieces we had leftover from another project. I painted the inside of the drawer green. The legs and the new wood added were unfinished wood so I stained them with dark walnut minwax stain. When dry I painted over the stain with green paint. Then I distressed it so that the legs would look vintage to go along with the drawer. The drawer was faded and very plain so I decided to paint it a light yellow and distress. I kept the drawer pull original. 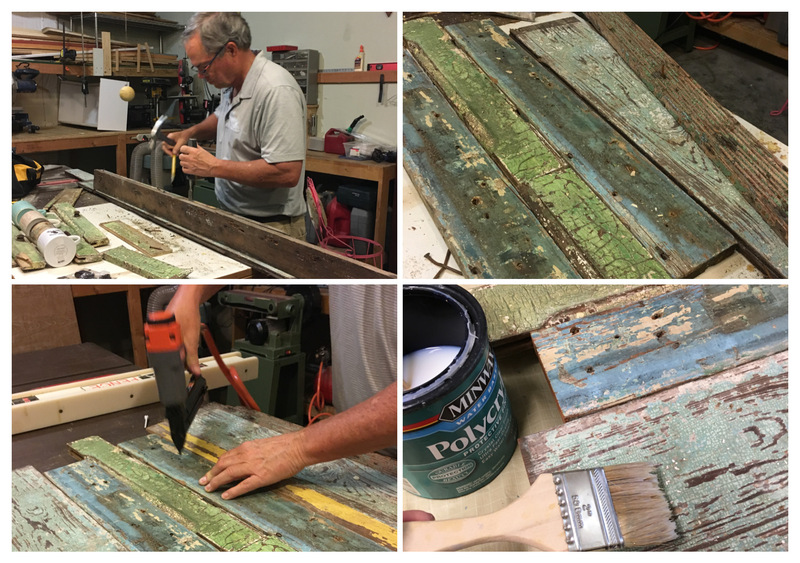 For sealing I used polycrylic over the reclaimed wood shelf and in the inside of the drawer. 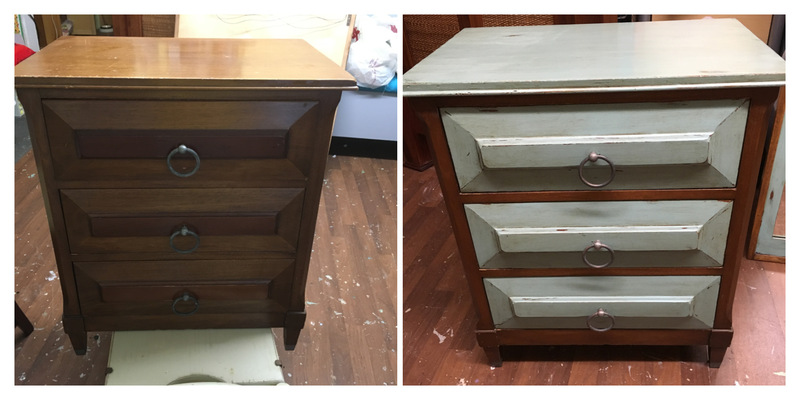 I used CeCe Caldwell’s clear wax on the drawer and the legs. I really like the way it came out and it is for sale in my shop and works well for displaying items. I do have some drawers I collected from when my daughter’s house flooded so always looking for great ideas to use for drawers. This SOLD around Christmas time! I love working with vinyl furniture! It is so easy to paint. 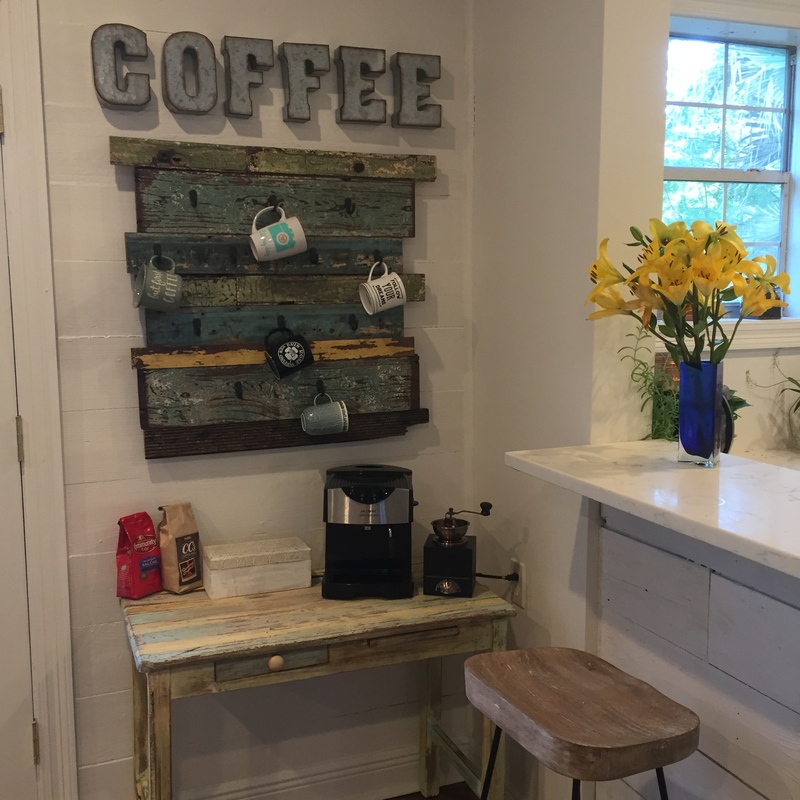 I used Sherwin Williams Drizzle made into chalk paint. I used Sherwin Williams Dover White for the chair legs and for the white flower stenciling. My inspiration- The flower stencil and the pillow. I knew the seat would be perfect for this stencil and the color Drizzle matched so well with it. It was my 1st time to use a foam pouncer by Martha Stewart. I really liked the way it went on smooth and was easy to clean. The flowers did not all look perfect but that’s ok. I put 2 coats of Polycrylic to seal the vinyl part of the chair. I painted the wood parts of the chair 3 coats, decided not to distress it and used CeCe Caldwell’s clear wax to seal. Here it is in my shop. I think this would be a fun accent chair. I’m not sure how well painted vinyl will hold up if the chair is used a lot and probably not animal or kid proof. I think a good name for this chair is “Grandmother’s Doilies”. The flowers remind me of lacy doilies. My friend asked me to paint some furniture pieces that she owned for her family’s vacation home they just purchased. I don’t do custom pieces too often but I decided to take on the projects. It was a challenge with the pieces being so massive but somehow it all got done within 2 weeks. She picked out the colors for all of the furniture and sent me pics of the bedspreads that would be used on both beds. 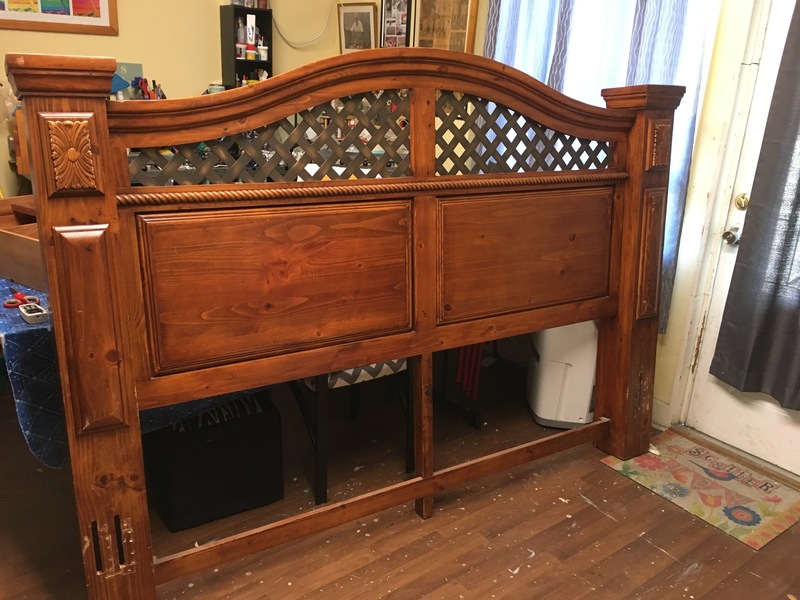 The first piece I worked on was a King size headboard and footboard. 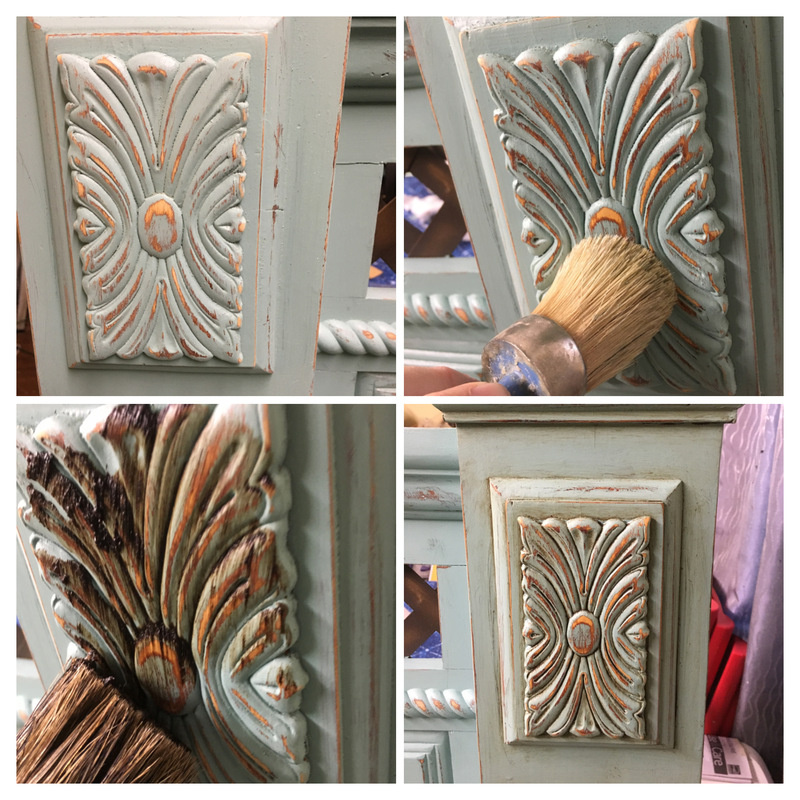 I painted it Sherwin Williams Drizzle made into chalk paint. Then I distressed it, then sealed it with clear and dark wax. We decided to leave the metal lattice the way it was. 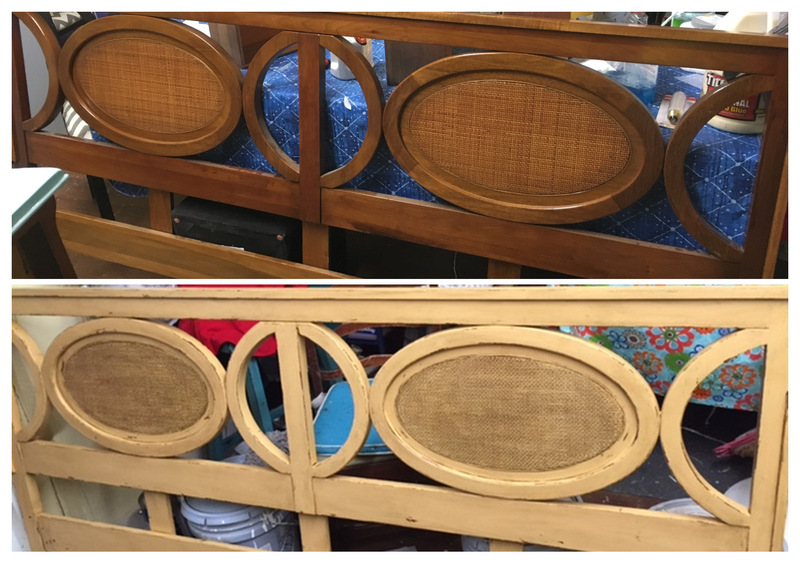 I love the designs on the sides of the headboard and how they came to life when distressed and waxed. The footboard was so thick and solid it could stand up on its own. This made it easier to paint because I didn’t have to lean it on anything. 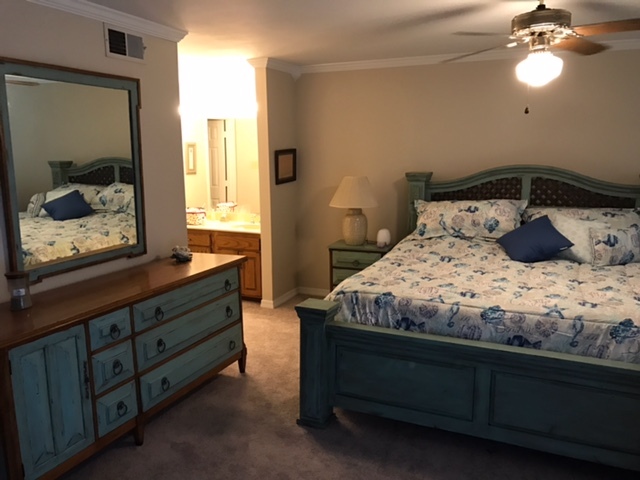 The next piece was a dresser that my friend wanted to match to the bed even though they originally didn’t go together. I first planned to paint the entire dresser but as I examined the wood I didn’t want to cover it all. The top was in great condition and had such a shiny varnished surface. I knew it would be better to leave it alone. The parts of the dresser that framed the drawers were also left with the original wood . 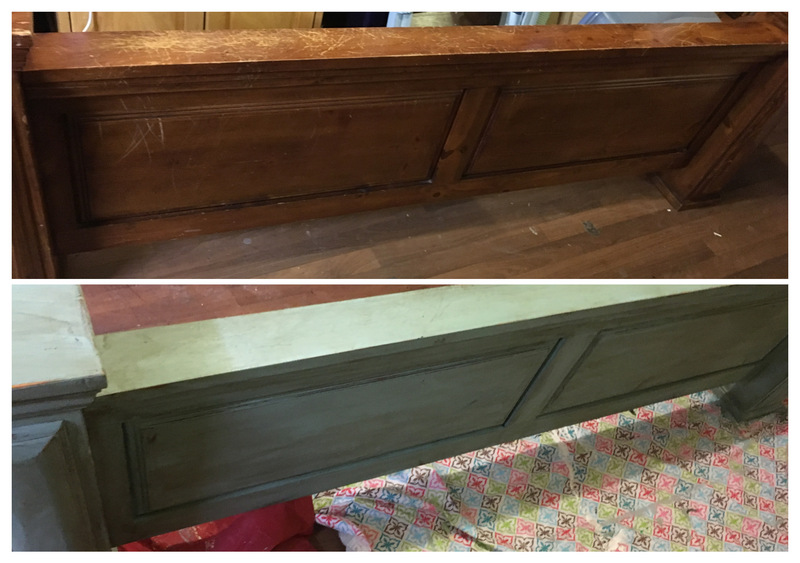 I experimented with leaving the middle panel of wood on each drawer and the cabinet with the original wood but ended up painting that later. 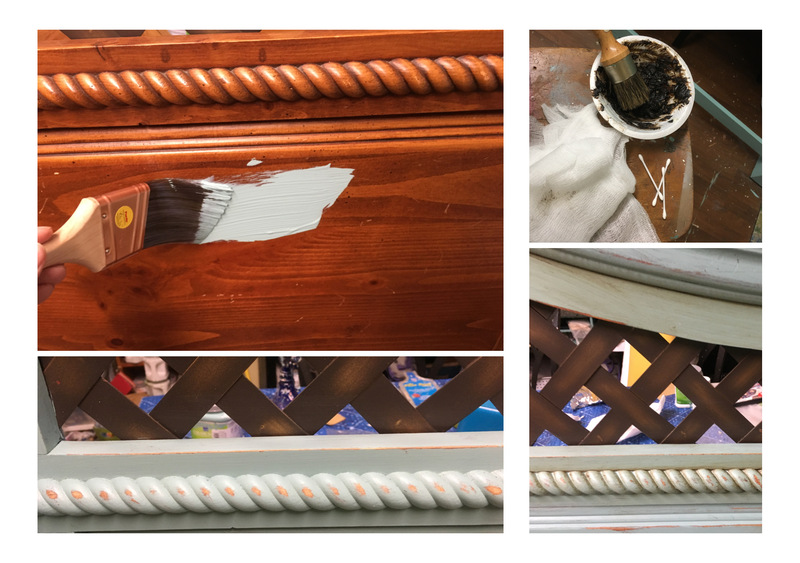 I kept on the original hardware & added some rub on bronze to help them tie in with the bronze accents on the metal lattice on the headboard. This was what it looked like when I experimented with leaving some wood on the drawers. It was interesting but not what the client had in mind. Next I painted a matching nightstand and mirror. Here is the picture of the complete set in her vacation condo. I think the colors she picked really work well with the bedspread. 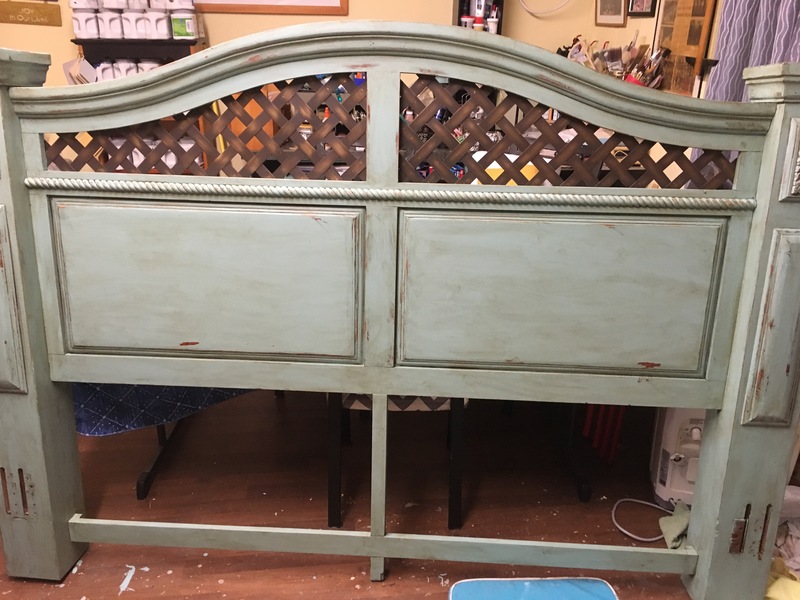 Another furniture piece was this headboard for another bedroom. It is a very unique piece and had bamboo inserted in the center ovals. I painted both front and back with Sherwin Williams Viva Gold. I sealed it with a clear and dark wax. I was very relieved and happy when I finished all 6 pieces and they were picked up from my workshop, just in time for Thanksgiving. They were able to set up their condo and enjoy it Thanksgiving weekend. It is always a learning experience to do custom pieces and it was great to work with such high quality furniture. It is rewarding to see the pieces in their new home and one day I plan to go see it in person.